For several years Child-Link has supported the Gnana Deepam Matriculation School, providing funds to build classrooms, refurbish a toilet block, develop a new dining hall and support other minor works as the need has arisen. Now our commitment is to provide money specifically for the education of girls. This school is run by a local charity. Having been set up originally by Roy and Catherine Devaraj in the late 1980's with just 12 children, this school, set in the Chinna Kalrayan Hills of Tamil Nadu, now caters for around 600 fee paying children and is recognised by the State Government. The children are educated from the age of 4 in English and Tamil, giving them greater opportunities when they take their GCSE /A level equivalent examinations at the end of their education. This type of education would usually be the reserve of the rich or elite. The children who attend the Gnana Deepam school are from tribal, illiterate families. Their parents are at the lowest end of the wage scale and the children are considered underprivileged. Without the excellent education the children receive at Gnana Deepam the best careers they could aspire to would be as daily labourers on building sites or farms. The quality of the teaching that they receive has enabled Gnana Deepam graduates to enter further education and then take up careers as doctors, nurses, physiotherapists, accountants, biochemists, engineers, teachers and tailors. Some have returned and now use their expertise to enrich their home communities. Indeed, two past female pupils who qualified as teachers now themselves teach at Gnana Deepam. 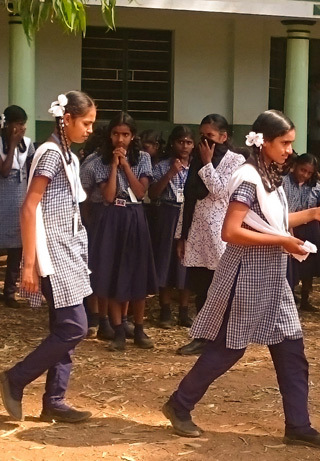 Read more about some of the girls who have benifited from an education in Gnana Deepam, India. Every 6th girl child's death is due to gender discrimination. when a girl has the opportunity to be educated and healthy not only does she benefit, society as a whole benefits. Educated girls marry later, have healthier children and take an active role in their communities to ensure the rights of other women are upheld. To prioritise the education of girl children, Gnana Deepam offer a scholarship program for needy or vulnerable girls. Bellow are the stories of some the families who are currently benefitting from this. Jayalakshmi is a young widow from a nearby village. She comes from a farming family, and has four daughters. In Indian culture, having a daughter is seen as a big burden on a family, due to the cost of marriage and dowry (illegal but still widely practiced), and the fact that once married she will leave her parents and no longer be of any financial or practical help to them. So you can imagine that Jayalakshmi was under enormous strain when her husband passed away and she was left with 4 young girls to care for. She came to us at Gnana Deepam looking for help. We offered her a job as a classroom assistant, with a steady income, and also enrolled her younger 3 daughters into the school with full scholarships. The eldest of the three – Geetha – passed her government exams here with us last year and has gone on to higher education. Her youngest twin daughters, Yamuna and Ganga are currently studying in year 8 and doing really well. Jayalakshmi now has a hope for their future. Through her job here she has been empowered to live an independent, self-sufficient life, where she can provide for her children. Her daughters have been able to get a good quality, English education, which will open doors for their future and allow them to pursue careers. Juliet is a young lady who lived and studied with us throughout her schooling. She came to us at age 7 as her family could not afford to educate her, so we offered her a full scholarship for hostel and school. She blossomed during her time here, and grew into a mature, thoughtful woman of God. Her faith always played an important role in her life. When she finished her higher education she came back and worked in our school while studying by correspondence for her degree in English. During this time her family were pressuring her to get married, and she prayerfully began looking for a husband. Her education and her faith gave her the independence and confidence to break out of the social norm of marrying within her caste, and she married a lovely young man from the neighbouring state of Kerala. She began a new life there with him, where she was an active member of their church community, and taught in the preschool run by them. This year, her husband and herself have enrolled in a year-long Bible training course in Bangalore. She still keeps in regular contact and visits us often. It is such a pleasure to see how her time here has helped shape her into the happy, confident woman she is today. Regina is a young lady who has been with us for over 20 years. She is one of 3 daughters in her family, but the only one who came to us for education. We took her into our hostel and gave her free education and accommodation as her family was not able to pay. Over the years she has blossomed here. She completed her government exams in our school, and went on to further education where she gained a diploma in early childhood development. In contrast, her elder sister was married at the age of 16 and works doing field labour. Education has offered Regina an opportunity to break out from the cycle of life that was expected for her and step into a future of much broader horizons. Since she finished her diploma we have employed her as a teacher, and she is studying for her Bachelors in Education alongside her work. She is happily married with a young daughter who is also receiving free education in our school. She is a lovely, well spoken, hard-working young woman, who is a blessing to our school and to her community.